One of the problems with keeping a blog is that your loved ones always know what they’re getting during the holidays. Oh well! HAPPY SOLSTICE GUYS! THIS STUFF IS DEEEE-LISH. Ha! 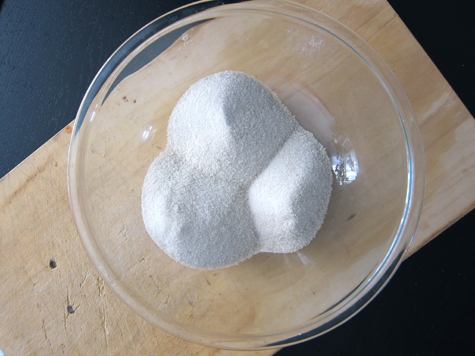 1) Place your sugar in a large mixing bowl. 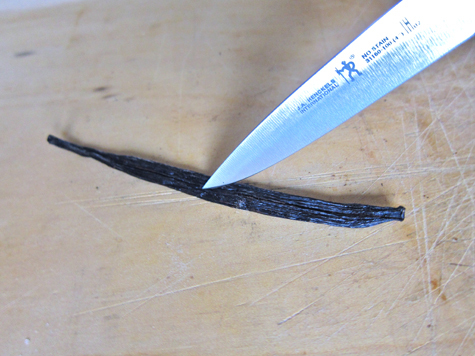 2) Use a small sharp knife to split each vanilla bean. 3) Make sure you let your assistant smell real, fresh vanilla for the first time. 4) Carefully scrape the seeds into the sugar. Cut each bean into pieces and add them to the mix. 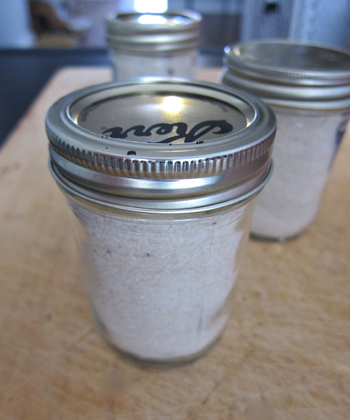 5) Mix well and transfer to jars. 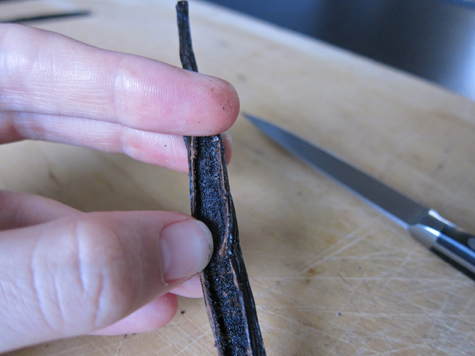 Make sure that a few pieces of vanilla bean end up in each jar. And that’s it! Decorate, wrap, or otherwise adorn as you see fit. 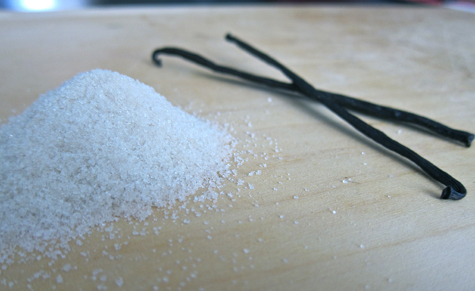 Vanilla sugar will keep for ages, and you can even keep adding more sugar as the bean will continue to infuse over time. Enjoy! 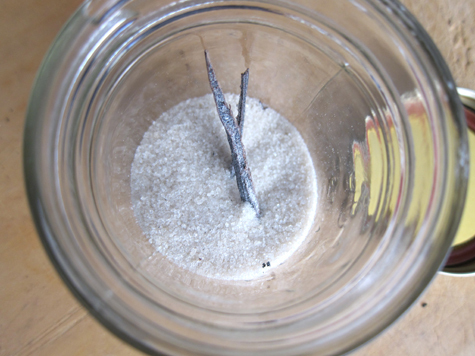 You can do the same thing with a cinnamon stick, cardamom pods, dried orange peel or lavender flowers. Homemade Indian curry powder, with a recipe for a chickpea and zuchinni curry. Jars of homemade pasta sauce, with a recipe for eggplant lasagna. A variety of homemade body scrubs and body butters. @erosan – you should make both! 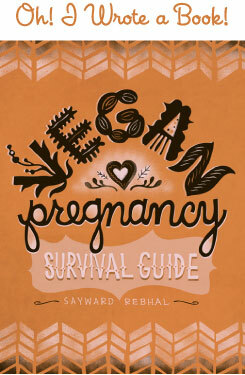 But make a raw vegan vanilla ice cream – WOW. Vegan or not, the stuff is amazing. Check out Matthew Kenney’s recipes. Waits face… oh my. He’s just too adorable. And those eyes… I suppose that’s an appropriate expression after a sniff of fresh vanilla bean ;) This is a fun (and easy!) idea, especially if including an attached recipe for something requiring vanilla sugar. @sarah: do you have a link to that recipe? I don’t think I’ve ever done RAW vegan ice cream… what better occasion than this to make one! I just hope the recipe won’t call for any of the weird substitutes, as most of them (actually all of them, except soy milk) are pretty much impossible to find in this city. At least I don’t know where. 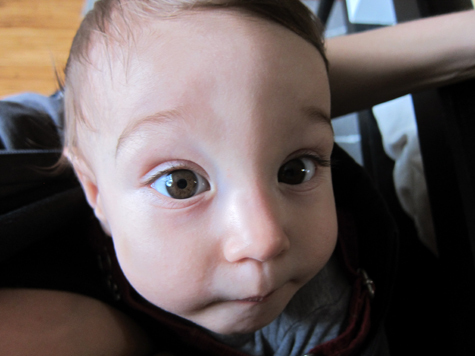 & seriously, Waits is one of the cutest little people I have ever laid eyes on (& I have seen a LOT of cute babies). His facial expressions crack me up! My heart can’t take the cuteness!!! LOVE Waits expression as he sniffs!!! Oh, what a little sugar Waits is! 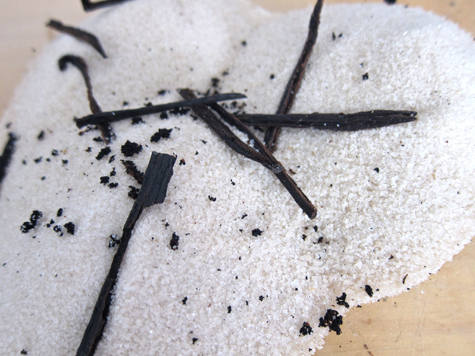 The vanilla bean sugar looks like something I need in my life. Thanks! <3 Vanilla sugar! We also put extra vanilla skins (?) in sugar for nomness like Rebecca mentioned, but having the caviar in there would be awesome too. It's really pretty once it cures! We made a bunch of our own vanilla extract this year and gave some as gifts. Every time I pull down the rum bottle to put vanilla in something, my 2yo asks for a smell :) OMG it smells so good. I put about 8-9 beans (split open) in a full 750ml bottle of dark rum and let it set. The molasses tones of the rum + vanilla means I want to swig it before it's done. Is that like spiced rum? What's in spice rum anyway? So far I've resisted :D The awesome thing about the extract (like the sugar) is that you can just keep adding rum. And used beans for that matter. It lasts for ages too. Also, I found a nice cheap source of beans… Haven't researched them much, though, beyond their price! Are you a Happy Solstice person too?? We're doing our first at home celebrating of the solstice this year with our little family, and it's pretty fun. It's opening up Christmas day for us, and I've been thinking about ways to spend the day… maybe visiting a nursing home? I used to do that more regularly… any ideas? Some people I know are going to volunteer at a soup kitchen, but I imagine they get plenty of helpers. Happy Solstice back! Haha, Waits is such a lucky little dude to have so much love coming his way. Thank you guys! I am living in Germany, and cannot find vanilla extract. I make my own by doing the same with the bean and steeping in vodka…not quite the same intensity as back home, but in baked goods, the flavor is the same….oh fresh vanilla is da killa!